Welcomed by a water arch, the 72 passengers onboard this inaugural flight, operated by Airlink, have made the history books as the first people to fly on the scheduled air service between OR Tambo Airport in Johannesburg and St Helena. To mark the occasion, all passengers received mementos in the forms of duplicate boarding passes, a certificate for travelling on the first flight and a welcome pack of souvenirs. It will be particularly memorable for St Helenian Olive McCormack (nee Yon) who was the first passenger to step off the flight. This is Olive’s first return visit to the Island in 27 years. Guests onboard – travel operators and South African, French and UK Media – were able to sample 24 hours of what St Helena has to offer as they undertook tours to various key attractions on the Island. Everyone onboard the flight were also invited to a reception at Plantation House hosted by HE Governor Lisa Phillips on Saturday evening where a specially made cake for the occasion was cut by the Governor and the two youngest passengers on the flight. Flights to St Helena will now become the norm as Airlink operates to and from the Island each Saturday. The beginning of this commercial air service is St Helena’s link to the rest of the world and will transform the Island’s tourism industry, as well as the Island’s agriculture, fisheries, and construction. Visitors previously would travel for a week to reach St Helena from South Africa and then another week to get back. The Airport means travel time will be less than six hours making it 20 times faster. This will make a big difference for tourists and business people, with the potential to open up new markets for St Helena. Equally it will allow Saints to be more easily reunited with their friends and loved ones for shorter trips, as well as opening up access for Saints off-Island who’d like to return home for a short visit. Commercial flights will also allow people with health issues that need treating off-Island to access experts and specialist equipment quickly as well as allow investors to visit the Island more easily and identify new opportunities to create wealth and jobs. As such, this week investor Paul O’Sullivan CEO of the St Helena Corporation PLC, one of the visitors on the inaugural flight, starts work on his new development on St Helena. 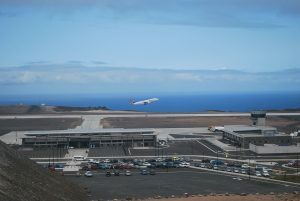 St Helena Airport has been termed by one UK publication as the ‘People’s Airport’ – St Helena Government believes this is an accurate definition of what the Airport means to the people of St Helena. A photo of the inaugural flight departing St Helena Airport on Sunday, 15 October 2017, is attached to this release.